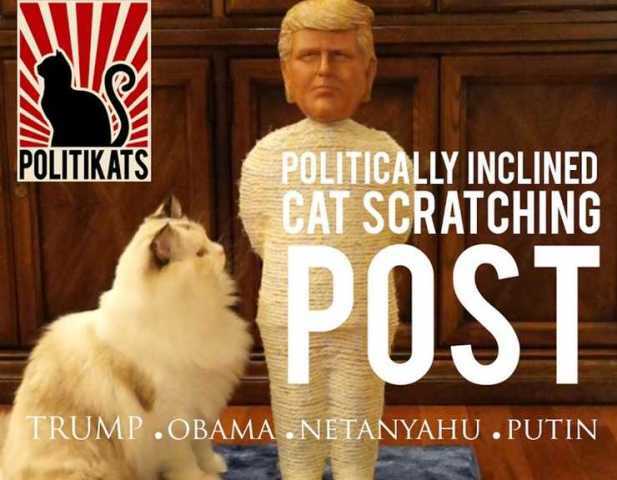 Politikats are "Politically Inclined Cat Scratching Posts" featuring uncanny likenesses of Donald Trump, Barack Obama, Benjamin Netanyahu, and Vladimir Putin. 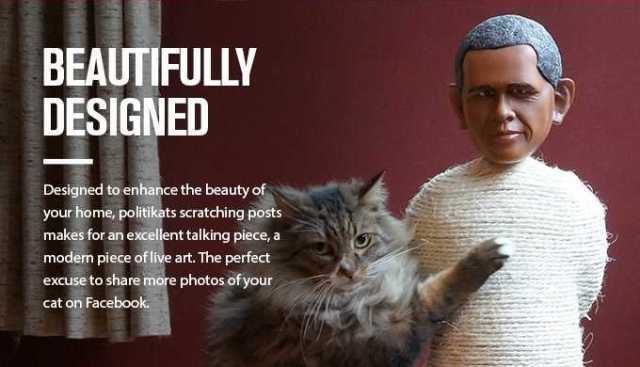 Now you can share your pets' claw-exercising pleasure as they shred these rope-wrapped symbols of a flawed political process and (hopefully) leave your innocent furniture in peace. To quote president Barack Obama, “I did not run for office to be helping out a bunch of fat cat bankers.” Maybe so, but what about all those other cats, regardless of their obesity issues or connections to the financial industry? Don't they deserve a safe and satisfying way to sharpen their claws and work out their frustrations? Of course they do – and Politikats can turn that dream into reality! Each ergonomically-designed Politikat stands 26 inches tall and is securely mounted to a 15”x15” base available in your choice of red, blue or gray. The figures are wrapped in 1/8-inch thick sisal rope and the variety of indentations inherent in the design offers cats a range of different scratching angles. You might be wondering why your finicky feline would choose clawing the daylights out of a Politikat instead of decimating your fine furniture, and it's a valid point: you're all seen those online images and videos of cats ignoring their new bed/exerciser/toy in favor of the box it came in. Never fear, the clever minds behind Politikats have been there and done that! Every purchase includes a bottle of “Eau de Katpiss” (their name, not ours) made from steam-distilled blended catnip. Spray some on your Politikat and let The Clawing Games begin! You also get a custom velvet cover to keep your Politikat clean and dust-free when not in use or for when you're traveling. Politikats was conceived in April of 2015 with an early-2016 Kickstarter campaign set up to fund the project's launch. Time will tell if funding is successful but keep your paws crossed; it would be a shame if Politikats were, er, scratched. In the meantime, be sure to check out these 15 Best Cat Scratching Posts - From Fun To Fabulous!